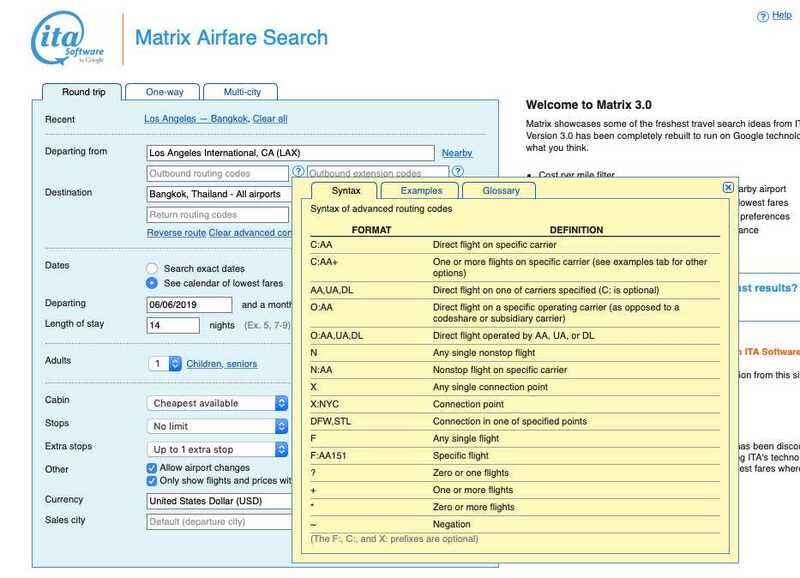 The ITA Matrix is a powerful piece of flight software, and it’s the force that powers Google Flights (and other search aggregators, like Kayak and Orbitz). It was created by a group of MIT scientists in 1996, and Google acquired it in 2010. 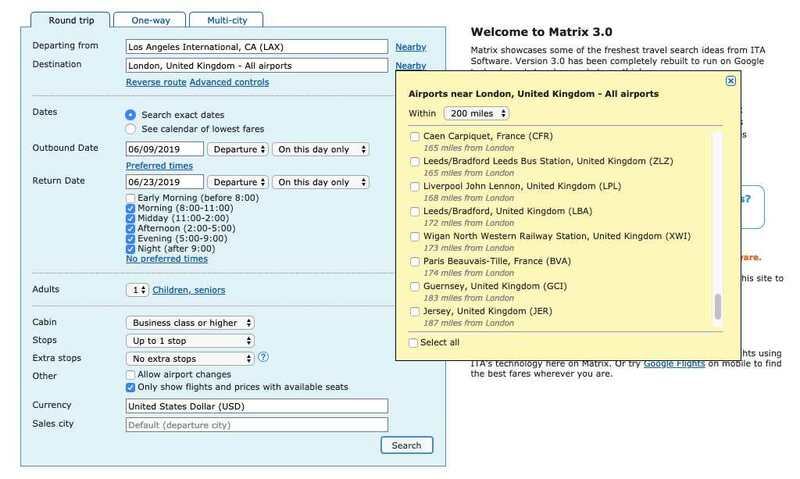 The ITA software uses airline metadata to find the cheapest flights, but it also has a knack for finding specific options that aren’t as easy to unearth on other search engines. 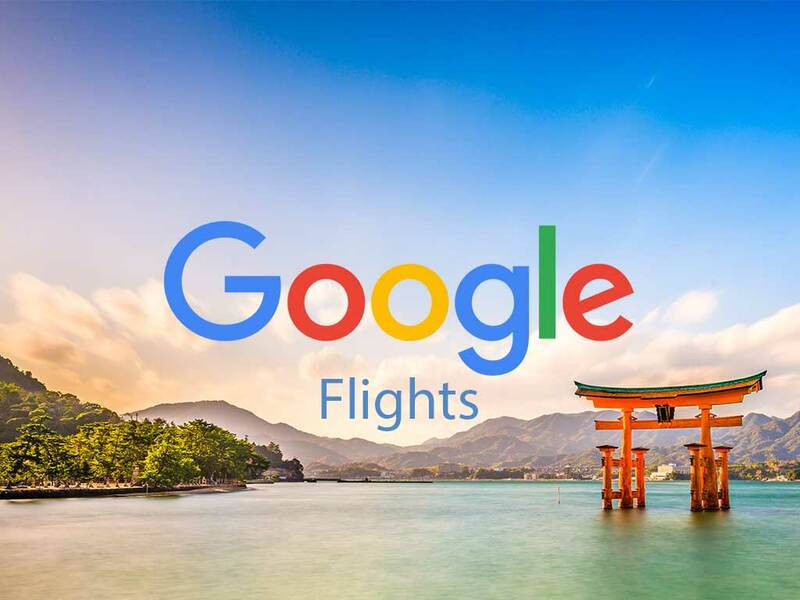 You can do a lot of the same stuff on Google Flights, but not all of it. If you’re a more advanced searcher or know exactly what you want, you may prefer using the Matrix to more quickly and easily find the options that fit your specific needs. Basically, if you want a super customizable search, ITA Matrix is for you. Customization. 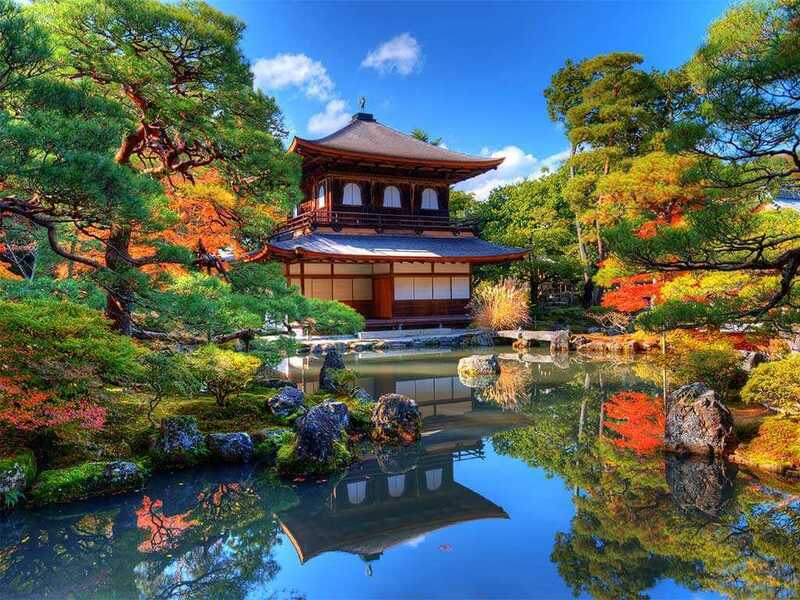 Want to find a morning flight to Tokyo on United with an overnight layover in San Francisco? You can use advanced codes to search for only those flights, and ITA Matrix results filters show things like the cost per mile and color-coded time bars. 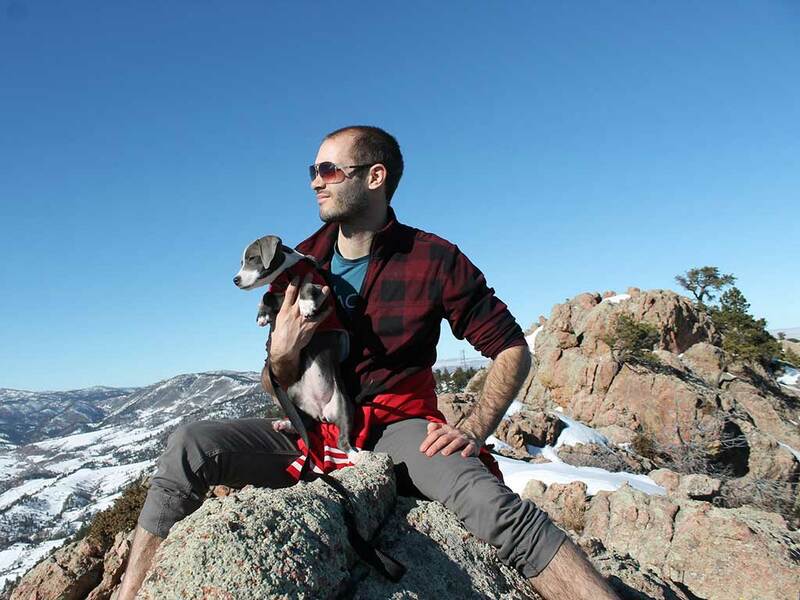 It’s ideal for a very experienced traveler (like mileage runners and road warriors) with specific travel needs. Longer load time. The search engine does not bring back results as quickly as other aggregators. Not fully comprehensive. Most airlines are included in ITA Matrix flights, but not all. Clunky interface. The ITA Matrix is not overly easy (or fun) to use, and if you don’t know your way around it, you’ll miss a lot of cool features. No booking. 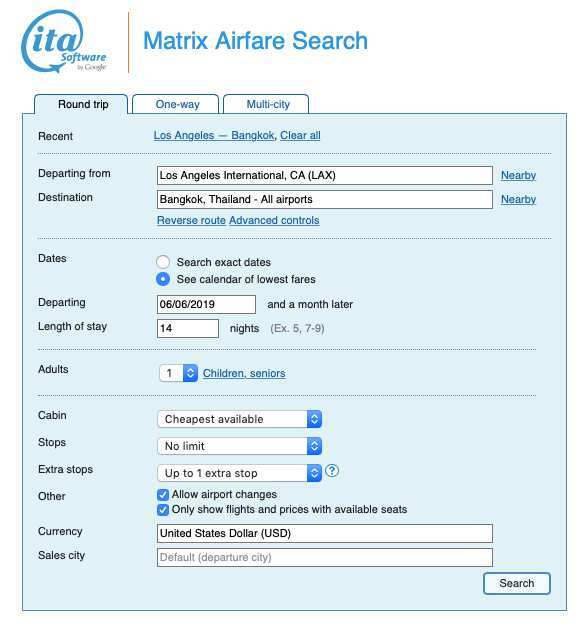 As with Google Flights, you’re unable to book directly through ITA Matrix. Multiple city search is limited to cities nearby. This is a recent change, and it means that if you’re just looking to get to Europe cheaply you’ll have to search options region by region (you can’t search London and Warsaw together, for example). 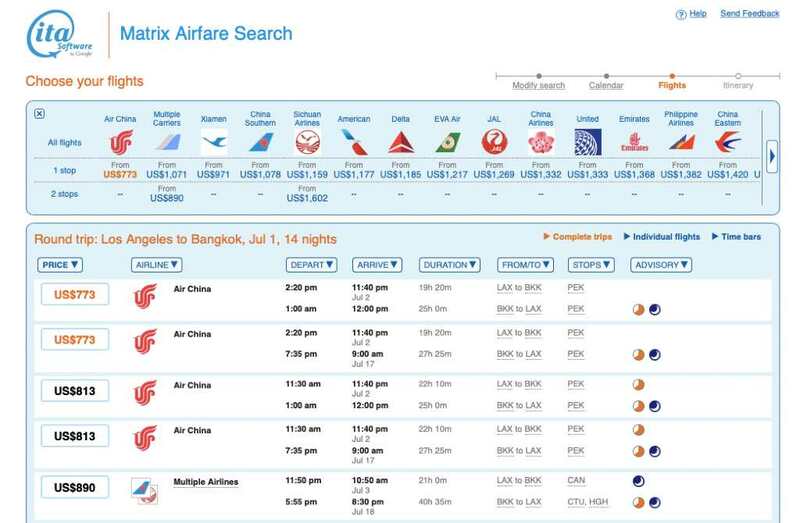 In the first part of this tutorial we’ll show you how to search for flights with the ITA Matrix using a route from Los Angeles to Bangkok in June. 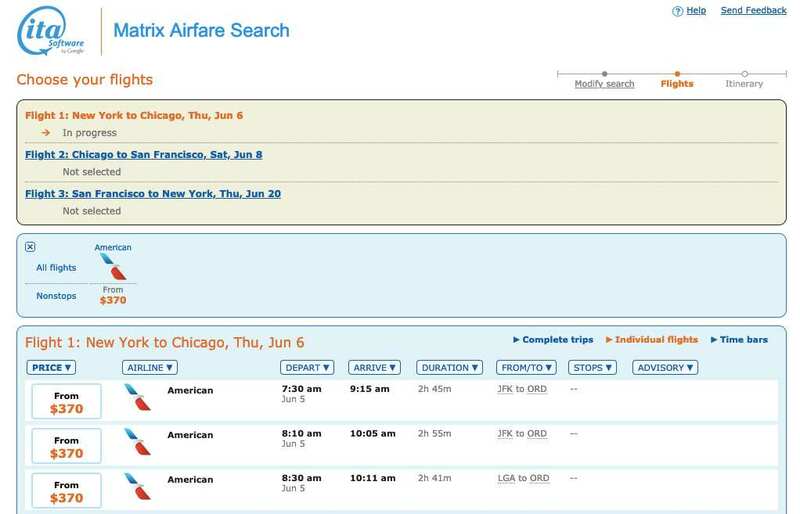 For this example, we’re looking for the cheapest flights in early June. 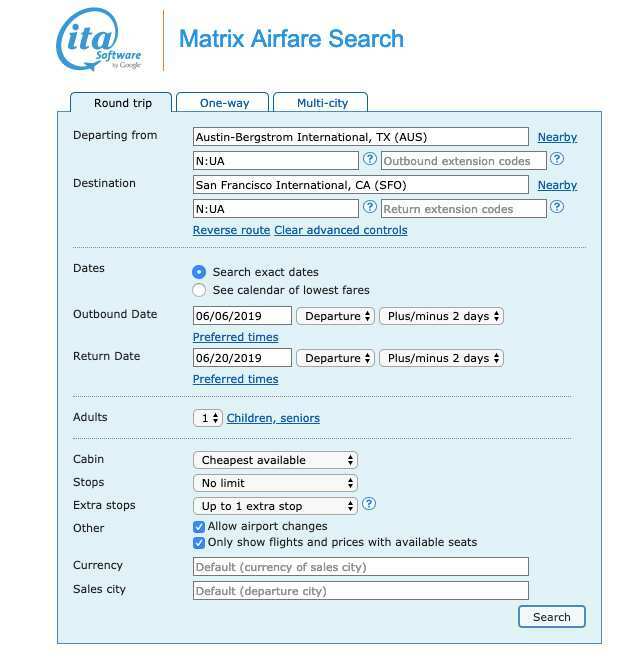 ITA Matrix lets you select nearby airports, and you can also select “See calendar of lowest fares” to find the best option within a month after your departure date. For everything else, we’re picking the cheapest available cabin class, with no limit on stops. We’re also looking to stay in Bangkok for two weeks. ITA Matrix’s calendar option gives a very clear view of when the cheapest flights are. The cheapest date is from July 1st, for $773, returning on July 16th. This goes beyond the month calendar view—if you need to stay strictly within the June 6–July 5 dates, the cheapest routes start at $813. This is what the search results look like when you select the cheapest option on the calendar. 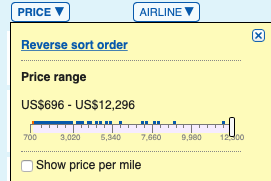 One of the really nice things about ITA Matrix’s search results is the ability to see what other specific airlines are charging for the same route. If you collect points with American Airlines, for example, you might be willing to fork over the extra couple hundred dollars to fly American. When you click on the price of the flight, you’ll get a detailed itinerary. However, it’s important to understand you cannot book through ITA Matrix. You won’t even get referred to another website; instead, you have to keep the flight details handy and book via a travel agent or directly through the airline or another booking service. You can see just how much mileage you get out of this route (shown to the right of the itinerary). You can also click on the links under “Airport Information” to learn more about the airports. Sometimes you’ll even get information about CO2 emissions, and cost per mile. 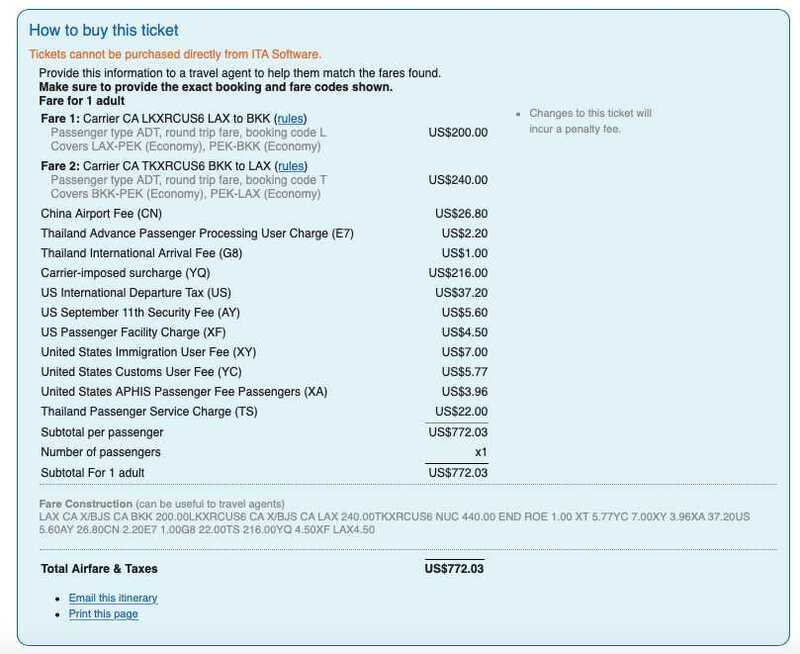 In the “How to buy this ticket” breakdown, you’ll notice information for “rules” and “Fare Construction.” If you’re booking this flight with a travel agent, they’ll need this information. This is useful especially if you can’t find this deal yourself on other search engines. Let the travel agent work his/her magic. This visually pleasing graph breaks down the duration and times of each leg of your trip, and each bar is color-coded per airline. If you hover your mouse over the time bar for Air China, you’ll see that the flight from Los Angeles to Beijing is 12 hours and 50 minutes, and then the next leg is much shorter. This is a lot of fun to play around with, as it gives you some visual understanding of how long and/or complicated your trip is. Let’s go back and search for a flight with more specifics. This time you’re flying from Los Angeles to London and you’re looking to get the best bang for your buck. The dates are more specific, but you want to play around with comfort and customization. You don’t want an early morning flight, you’re looking for business class or higher, and you want to get there with minimal stops. Note the “Nearby” menu option next to the destinations. With London, you can select a range of airports in the UK and France. This is useful for when you’re looking to just make your way over to Europe. 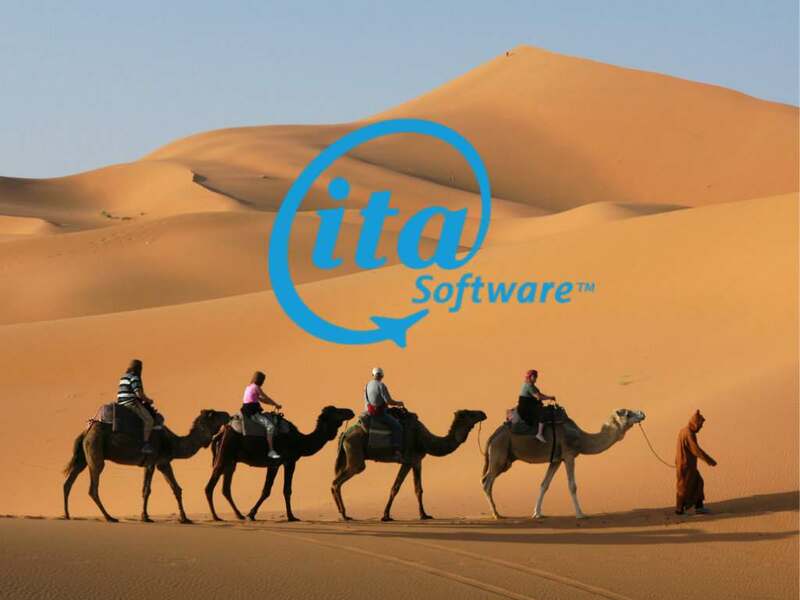 Now let’s explore some of ITA Matrix’s advanced features. You might have noticed in your search results (like from Los Angeles to Bangkok) that you’re automatically taken to the “complete trip” breakdown. The “individual flights” tab lets you pick the best flight per leg of your journey. Would you rather overnight on the way to Bangkok, but not the way back? You can do that here. At the beginning of the search page, you might have noticed an option to view “advanced controls” underneath the boxes for departure and destination airports. When you click on “advanced controls” a whole new set of fields show up. And if you click the “?” next to each field, you’re met with some code breakdowns. Don’t be overwhelmed. Once you know the basics, this gets easy (or at least easier). These codes allow you to search for a very specific flight without having to navigate all the filters in the search results. Spend some time getting to know the syntax and definitions. The “Examples” tab is also particularly useful for wrapping your head around how this works. Google Support has a full list of codes. 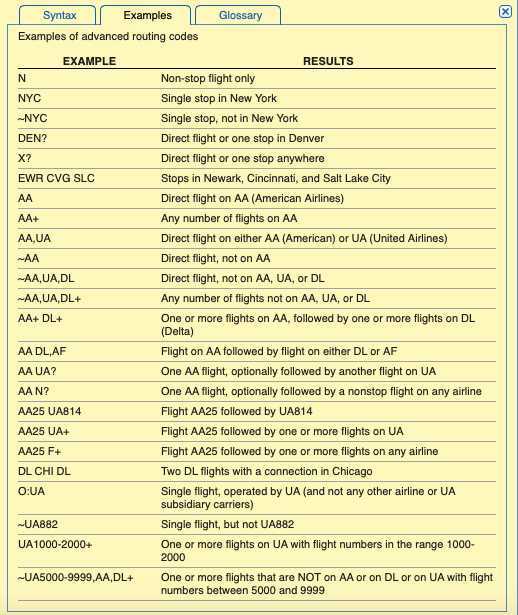 For example, airlines are marked with their two letter codes, and airports are marked with their three letter codes. 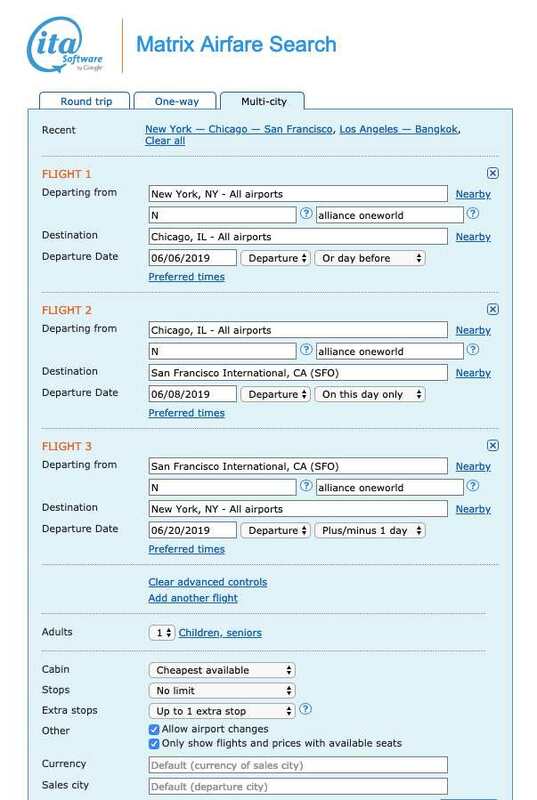 You can do things like search for a direct route with a specific carrier (or more than one carrier), search only for connections in a certain city, specify airline alliances, and even set a minimum connection time. Here’s an easy example. 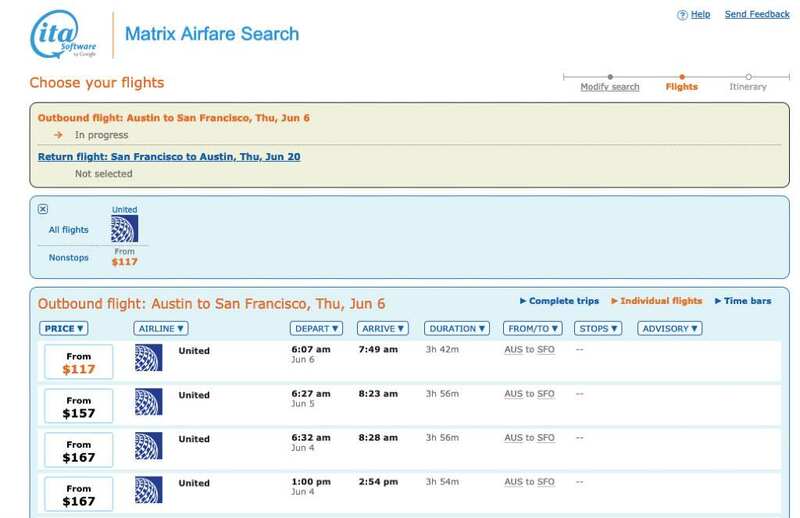 Let’s search from Austin to San Francisco, traveling direct only (as indicated by “N”) and with United Airlines (as indicated by the airline code “UA”). The results are tailored perfectly. We’d start in the multi-city tab, and select our destinations and dates. 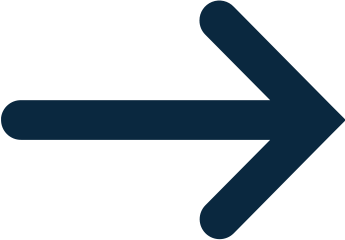 As you can see here, the “N/ alliance oneworld” denotes a non-stop flight with a Oneworld airline, while the “/-overnight” restricts overnight flights. Here are the results from the first leg. $369.30 for three flights. Not bad at all! You can really go as far in-depth with this as you want. Once you get a hang of the codes, the sky's the limit. 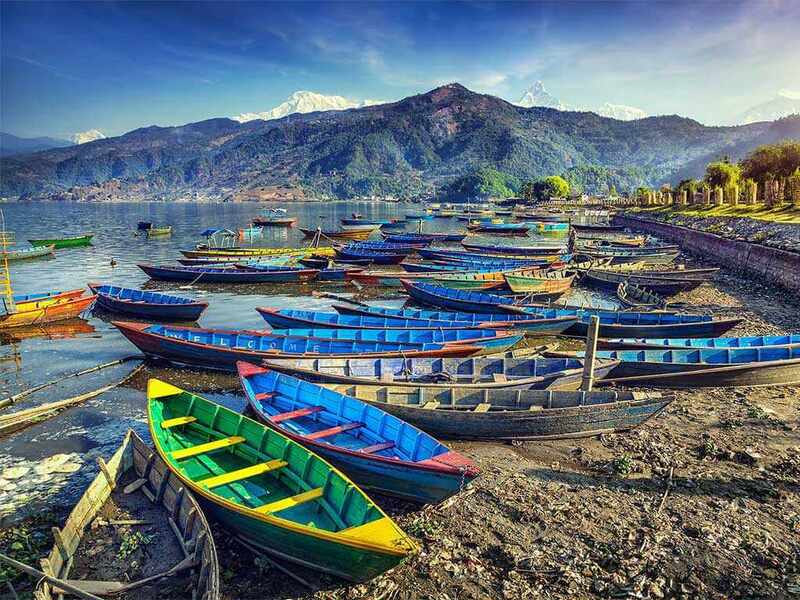 Sometimes you can find cheaper fares when you change the currency and location. There doesn’t seem to be any rhyme or reason to why this is so, but you can play around with it and see what results come up. 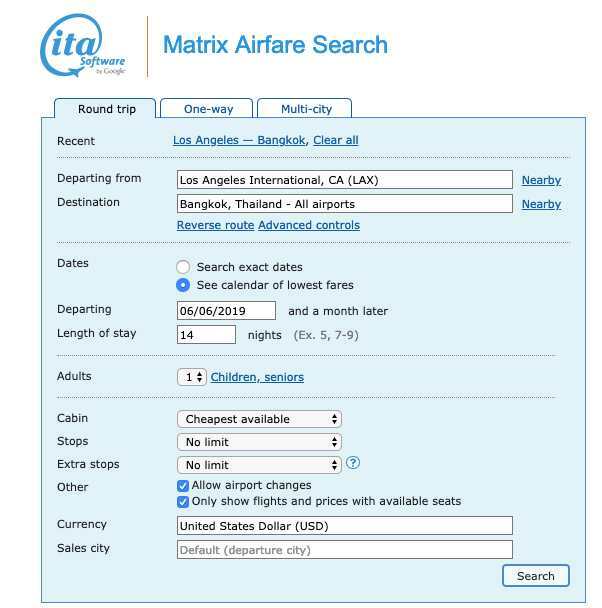 Taking our original example of Los Angeles to Bangkok in early June, ITA Matrix defaults to USD and Los Angeles as the sales city. 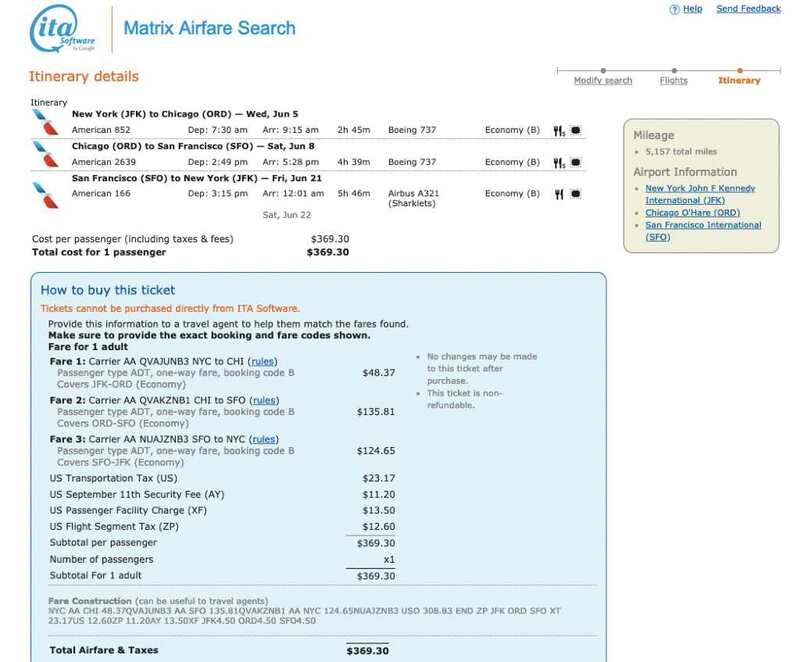 With that search criteria, and flexible booking for +/- 2 days, the cheapest airfare currently is $812.43. 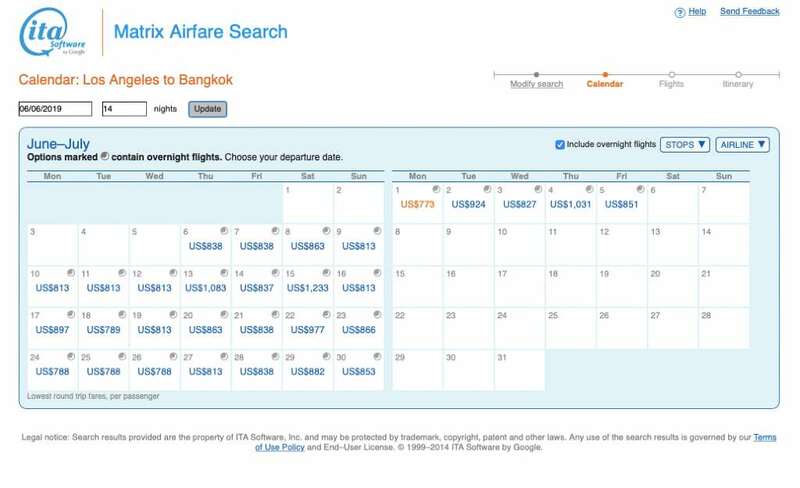 When changing the sales city to New York City, there is no difference in cost, but when we change the currency to Thai Baht (THB), the flight is slightly more expensive at $822. The difference isn’t significant, but it goes to show that playing around with your search options can yield different results. It is important to understand that you cannot book through ITA Matrix. 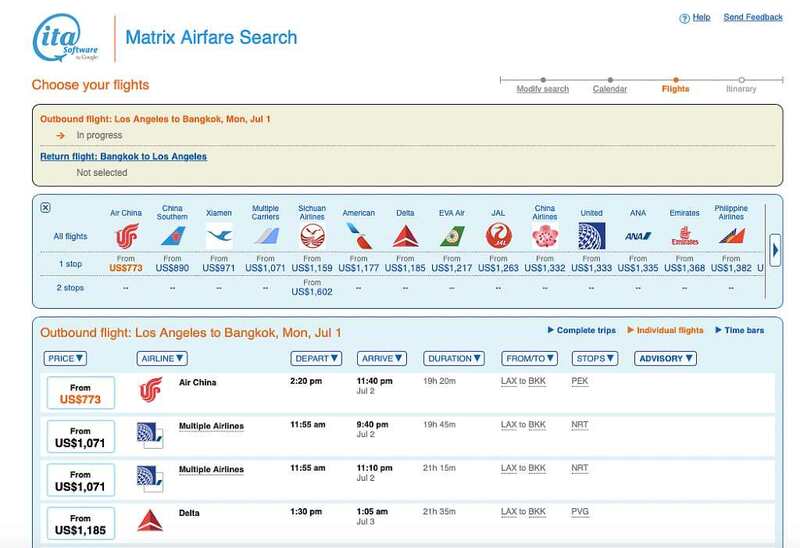 You can try to find your flights on an OTA (an online travel agency, like Google Flights), book directly through the airline, hire a travel agent, or use a website like BookWithMatrix.com—just remember if you’re not booking with the airline, the OTA’s cancellation policies apply. You won’t be able to see extra fees (like checked baggage or seat selection) until you’re starting the booking process through the OTA or airline’s website. You can, however, identify basic economy fares with ITA Matrix—in a roundabout way. In the example below, you’ll see that your economy ticket is marked with either a (K) or a (S). A quick search for United Airlines’ fare classes show that Economy (S) and Economy (K) means a step above Basic Economy, and you’ll earn 100% of your premier qualifying miles. However, fare classes can vary widely by airline. The Points Guy has a good explainer on fare classes. Bottom line: The ITA Matrix can be clunky and complicated to use for the average leisure traveler just looking for the best price, but if you have very specific travel needs, it can quickly cut through the clutter to surface the exact flights you need. Want more cheap flights? Sign up for Scott's Cheap Flights and get notified whenever there's a great deal from your airport.